Back in 2016 when Jonathon Richter went missing in the Welwyn area, SARSAV volunteers from the Regina, Moose Jaw and the Parkland (Yorkton-Melville) chapters were called in to help with the search. Now SARSAV, the RCMP, and Estevan and Weyburn police services want to start a SARSAV chapter in Southeast Saskatchewan. Shown here are some of the local and SARSAV volunteers getting organized to go out searching during the Richter case in 2016. 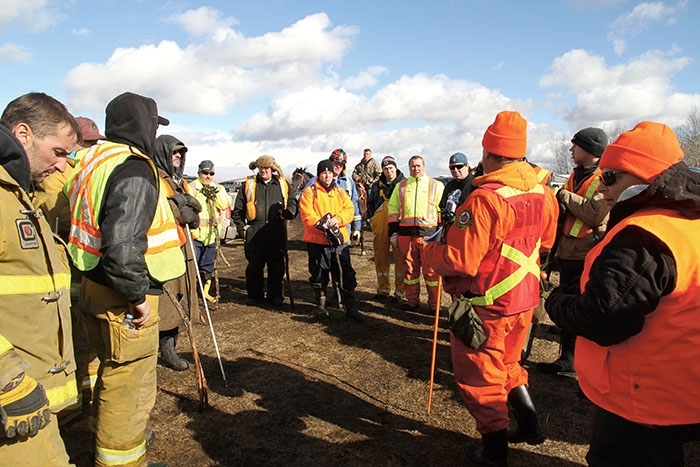 A group is hoping to get a volunteer SARSAV search and rescue chapter started in Southeast Saskatchewan and will be holding public information meetings from January 16-24 in four different communities in the southeast. SARSAV stands for Search and Rescue Saskatchewan Association of Volunteers. Currently there is a chapter in the Yorkton-Melville area (the Parkland Chapter) and another in Regina, but nothing in the southeast corner Saskatchewan. SARSAV is comprised of member chapters of search and rescue professionals who volunteer their time for training, search missions, preventative information and public awareness when someone goes missing. The meetings to organize a chapter in southeast Saskatchewan are being organized by a partnership between the RCMP Search and Rescue Team, SARSAV, Estevan Police Service and Weyburn Police Service. “There’s no established volunteer group in that part of the province,” says Cpl George Riffel with the Yorkton RCMP who got the Yorkton-Melville SARSAV chapter started. “The closest groups are Regina or Yorkton-Melville Parkland, and typically SARSAV likes to work with a 100 km radius. So that would be basically from the U.S. border 200 km north and 200 km from the Manitoba border that would encompass the border to the Qu’Appelle Valley coming up north, and from the Manitoba border over to the Weyburn area. “It’s just a matter of having a trained, organized group of volunteers that are equipped and ready to go in case of an emergency call coming in for a missing person. Public meetings are being held in Carnduff, Carlyle, Estevan and Weyburn. “What we would be looking for is the incorporation of a SARSAV chapter,” says Riffel. “SARSAV is Search and Rescue Saskatchewan Association of Volunteers. And they would work on call to assist the RCMP in the rural areas, or if it was a call in Weyburn or Estevan, inside the city they would work with city police to assist with missing persons searches. Riffel says there is a need for all kinds of skill sets when setting up a chapter, from people who want to be searchers to executive members. He says volunteers can choose to be involved as much as they want. “There are certain levels of training, there’s a basic searcher course and there is a team leader course, and there’s a search manager course,” he says. “So what level they want to be involved, that’s completely up to them. “There’s a need for all different skill sets and interests and levels of involvement. Riffel says SARSAV chapters also assist each other in different parts of the province when it’s needed. “A group like this for the Southeast, you may be called locally, and you will probably be the first group to get called locally, but if there is something in the Yorkton area, if the RCMP says we need 25 or 30 people here quickly to help here, and Parkland Chapter would only be able to get 10 due to people on holidays or away or sick or whatever, you start calling in neighboring groups too,” he says. Riffel says the goal of the meetings is to simply get a chapter started and once that happens, that chapter can start organize its volunteers into various different roles. Riffel, who has been involved with search and rescue for many years himself, and who got the Parkland chapter started, says there is enough interest in the Southeast that he knows a chapter will get going there. “I’ve been involved in search and rescue informally for 20-some years, but formally I’ve been on the RCMP team for seven or eight. I did the same thing here, started a group out of Yorkton and Melville. I just put the word out, said there isn’t a group here, is anyone interested in starting one, set up a meeting and had a bunch of people come out and then the group formed and away they went. “There is quite a bit of interest. I’m working with a member from Esteven city police and the president of the Parkland chapter is coming to the meetings. We’ve already reached out to a bunch of the fire departments and EMO committees to put the bug out to people that this is going on and get some interest going. There is quite a bit of interest. “I know with the mines there is some expertise and people there who have done some underground (rescue) work and we never know what kind of calls we are going to get. There are people all over that have skill sets and interests that can benefit the chapter.